Common misconceptions and myths about Facebook advertising often seem to discourage business owners, CMOs and marketing specialists from promoting their companies on the social media giant. But we have news for you: they’re called myths for a reason because they’re simply not true! Sure, user growth on Facebook has slowed in recent months, but it’s still one of the most beneficial advertising platforms for all types of businesses. It continues to capture the most time and attention than any other platform. For that reason, we broke down several common myths about Facebook advertising to help you understand the power behind Facebook ads. There are well over two billion users on Facebook. There are plenty of industry experts and business owners looking for what you offer. Targeting options on Facebook are plentiful, and you can focus on Lead generation campaigns. B2B content offering free downloads or trials do well on Facebook. If these points aren’t convincing enough, then consider this statistic: 89 percent of B2B businesses use Facebook over LinkedIn (81 percent) now. It’s clearly working. You might be thinking to yourself: I’ve tried B2B advertising on Facebook, but no luck. B2B ads on Facebook will often fail because they’re not relevant, calls to action are missing the mark or they’re simply not the right ad type for B2B. While there are many options for B2C companies on Facebook, there are just as many for B2B. There is a common misconception that boosting a post can get you the same results as running a Facebook ad, but that’s actually not the case—at all. Boosted posts have one purpose: to increase post engagement and impressions. Boosting a post won’t give you the same detailed targeting criteria as Facebook ads. Facebook campaigns run with the specific intent behind them, for example, a conversion campaign targets those most likely to convert. With that said, if you’ve been boosting posts with the goal of driving traffic the same as a Facebook campaign would, you won’t see the same results. Don’t let a small following discourage you. You don’t need thousands of Page likes for your Facebook campaigns to thrive. Facebook is home to more than two billion monthly active users. Your message is bound to get in front of a fraction of that number. You can create custom audiences and let Facebook put your product or service in front of those people—whether or not they like your page. You can even create specific audiences based on email lists you might already have or target based on demographics. Facebook has become entrenched with advertisers squabbling for ad space, so businesses feel that competition is too high. Therefore, companies shy away from even the idea of promoting their business on the platform. Despite the competitiveness on Facebook, CPC rates have remained steady for a few years (except Mobile App Installs and Post Engagement ads). With that in mind, CPC could always see an increase in the future, so it’s worth investing in Facebook advertising now. Marketers often focus much of their Facebook ads on retargeting efforts, but as you consider all parts of the marketing funnel, campaigns on Facebook work well for upper-funnel strategies, too. In this case, retargeting isn’t your only option for Facebook. Campaigns on Facebook can also serve the purpose of brand awareness, as long as you focus your content on promoting the brand and treat the ad more as an organic post. If you’ve ever been discouraged from Facebook advertising simply because people may not like it, you’re missing out on valuable leads! Of course, people don’t want to see ads that don’t pertain to them (or ads that seem unnatural or pushy). Facebook has a smart algorithm for this reason – it targets users based on relevant content. The more clicks the ad receives, the more relevant Facebook views it. The more relevant the ad, the more people see it and appreciate it because it’s an ad specific to them. 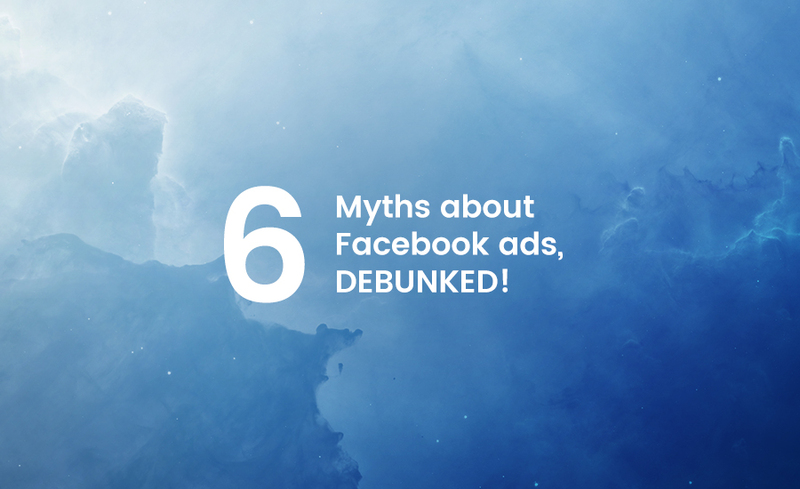 So there you have it – six myths about Facebook advertising debunked. These myths only skim the surface of the common misbeliefs out there. That’s why proper research is necessary to come to the conclusion yourself that Facebook advertising is so powerful for businesses.